Natives of the southern states know how frustrating it can be to dress for the fall season. You wake up to 30° F weather in the morning only to end up in 70° weather in the afternoon. If you wear a large, insulated coat as your main source of protection from the cold, you get overheated and sweaty. If you stick to a long sleeved cotton shirt, you are nearly guaranteed to be cold through a decent portion of the day. Thankfully, there is an answer to this fall fashion madness: Layering. At RefrigiWear, we have an array of layering options including base layers, sweatshirts, vests and lightweight jackets that will keep you comfortable through the fall season. 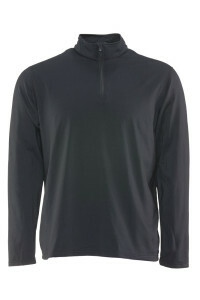 Base layers can suit a wide array of outdoor activities and conditions. The stretchy, breathable and comfortable fit of base layer shirts and pants will keep you comfortable during rigorous activity without leaving you overheated. Because they are breathable, base layers prevent moisture build-up on the skin so you can stay comfortable when paddling your kayak or hiking a trail. However, layering can also serve as protection beneath other cold weather clothing during less rigorous activity and when the temperature drops. For example, while camping or standing along the river banks to fish during a cool Fall evening, base layers provide a snug seal beneath heavier garments to trap in body heat and keep you warm even during prolonged outdoor exposure. 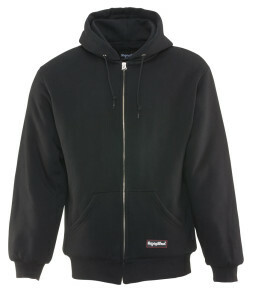 Sweatshirts and hoodies are an incredibly popular choice for combating chilly weather. Whether they have a pullover or full front zip design, sweatshirts have a relatively loose fit that make them easy to put on or take off. Because they also give you freedom of movement, they are a practical layering option for outdoor activities. For colder mornings or evenings, a sweatshirt paired with a base layer top will give you extra protection without requiring a heavy jacket. As the temperature rises throughout the day, the sweatshirt can be removed to regulate your temperature. For colder conditions and low intensity activities, a quilted or insulated sweatshirt can provide added warmth. Vests are a terrific lightweight option for layering. From bird watching and Geocaching to hiking and kayaking, vests provide free range of motion for your torso and arms. 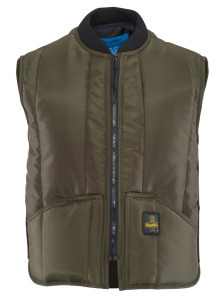 Vests come in a variety of materials, including puffer, softshell and fleece designs. These garments can range between lightweight materials and heavier, insulated Iron-Tuff versions. Many like to wear a vest over other layers like long-sleeved shirts or sweatshirts. Lightweight jackets come in an assortment of designs and materials, like fleece, softshell and puffer jackets. Each of these styles provide different benefits. One of the biggest advantages over heavily insulated jackets is that they are not rigid and can be taken off, rolled up or folded, and stored easily. Fleece jackets are one of the most popular lightweight jacket options. Even though they are great for cool weather, be careful as they are not waterproof and only provide wind protection to a certain point. Lighter-weight softshell jackets are perhaps the most versatile option because many are very water resistant, windproof and also lightweight. They are popular with many outdoor enthusiasts, like campers, hikers, golfers, sailors and fisherman. Quilted and Puffer jackets provide the best of both worlds because they are very pliable and lightweight while also providing a decent level of insulation. For example, if you are hiking on a chilly morning, a lightweight puffer jacket provides an excellent layer of warmth that can also be easily removed and stored away in a backpack to be used later.